FIRST -- Faint Images of the Radio Sky at Twenty-cm -- is a project designed to produce the radio equivalent of the Palomar Observatory Sky Survey over 10,000 square degrees of the North and South Galactic Caps. Using the NRAO Very Large Array (VLA) in its B-configuration, we acquire 3-minute snapshots covering a hexagonal grid using 2×7 3-MHz frequency channels centered at 1365 and 1435 MHz. In the most recent data, taken starting in Spring 2011, the frequency bandwidth is wider and the central frequencies of the bands have changed due to EVLA updates. See the observation status page for more details. The data are edited, self-calibrated, mapped, and CLEANed using an automated pipeline based largely on routines in the Astronomical Image Processing System (AIPS). A final atlas of maps is produced by coadding the twelve images adjacent to each pointing center. These maps have 1.8" pixels, a typical rms of 0.15 mJy, and a resolution of 5". The noise in the coadded maps varies by only 15% from the best to the worst places in the maps, except in the vicinity of bright sources (> 100 mJy) where sidelobes can lead to an increased noise level. 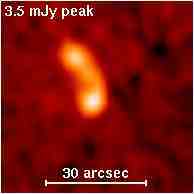 At the 1 mJy source detection threshold, there are ~90 sources per square degree, ~35% of which have resolved structure on scales from 2-30". A source catalog including peak and integrated flux densities and sizes derived from fitting a two-dimensional Gaussian to each source is generated from the coadded images. The astrometric reference frame of the maps is accurate to 0.05", and individual sources have 90% confidence error circles of radius < 0.5" at the 3 mJy level and 1" at the survey threshold. Approximately 15% of the sources have optical counterparts at the limit of the POSS I plates (E~20.0); unambiguous optical identifications (<5% false rates) are achievable to mv~24. The survey area has been chosen to coincide with that of the Sloan Digital Sky Survey (SDSS); at the mv~23 limit of SDSS, ~40% of the optical counterparts to FIRST sources are detected. Both the images and the catalogs constructed from the FIRST observations are made available to the astronomical community as soon as sufficient quality-control tests have been completed. In addition, the raw visibility data are available from NRAO as soon as the observations have been taken, so radio astronomers can make maps of particular fields of interest before our final images are available. Several papers describing the FIRST project in more detail are available. Thanks to the NRAO staff and others for their help in carrying out this major project.